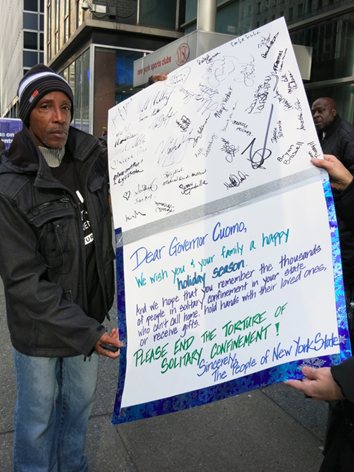 NY-CAIC also presented the Governor with a holiday invitation to spend 24 hours in solitary cell. If the Governor accepted, he would not be the first to choose to experience solitary confinement. Rick Raemisch, head of the Colorado Department of Corrections, spent 20 hours in solitary in January 2014, shortly before placing limitations on solitary confinement in the state. New York, like many other states, still does not restrict time spent in isolation. Incarcerated persons can spend years, and even decades, in solitary confinement, completely isolated from the general prison population. For more on the New York Campaign for Alternatives to Isolated Confinement, visit www.nycaic.org.